The Battle of Crete was fought during the World War II on the Greek island of Crete. It began in the morning of May 20th 1941, when Nazi Germany activated the airborne invasion of Crete. 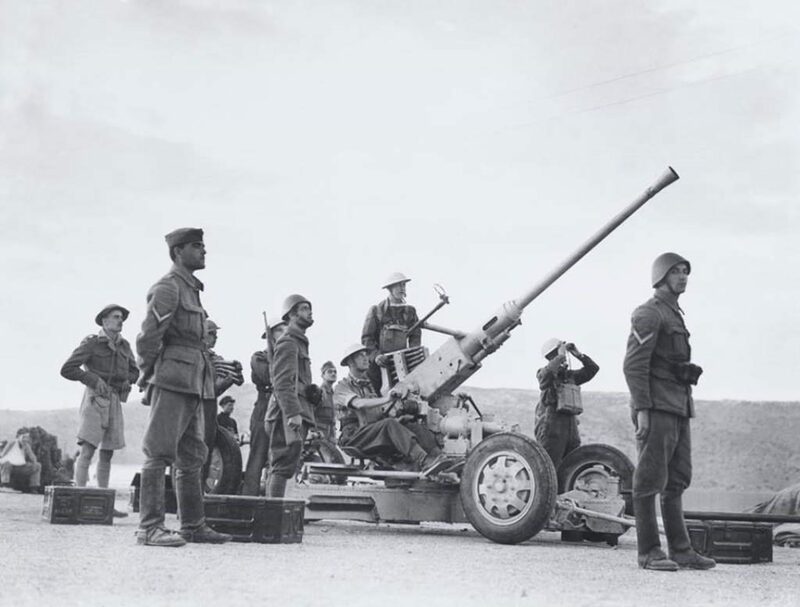 Greek forces and other Allied forces, along with the people of Crete, defended the island. 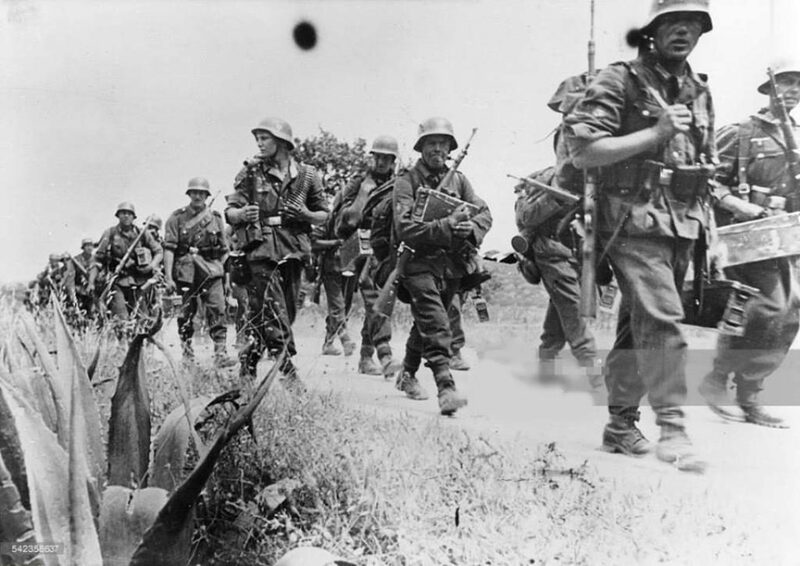 After one day of fighting, the Germans had suffered appalling casualties and the Allied troops were confident that they would defeat the invasion. The next day, through communication failures, Allied tactical hesitation and German offensive operations, Maleme Airfield in western Crete fell, enabling the Germans to land reinforcements and overwhelm the defensive positions on the north-west of the island. After a few more days of fighting, Allied forces withdrew to the south coast. Over half were evacuated by the British Royal Navy and the remainder surrendered or joined the Cretan resistance. The defense of Crete evolved into a costly naval engagement, the Royal Navy’s eastern Mediterranean strength had been reduced to only two battleships and three cruisers. The Battle of Crete was the first occasion where Fallschirmjäger (German paratroops) were used en masse, the first mainly airborne invasion in military history, the first time the Allies made significant use of intelligence from decrypted German messages from the Enigma machine, and the first time German troops encountered mass resistance from a civilian population. Due to the number of casualties and the belief that airborne forces no longer had the advantage of surprise, Adolf Hitler became reluctant to authorize further large airborne operations, preferring instead to employ paratroopers as ground troops. In contrast, the Allies were impressed by the potential of paratroopers and started to form airborne-assault and airfield-defense regiments. […] Turning to Student, the Fuhrer said quietly: “Of course, General you know that after Crete we shall never do another Airborne operation. The parachute arm is one that relies entirely on surprise. That surprise factor has now exhausted itself…the day of the Paratroops is over”. Crete, May 1941. 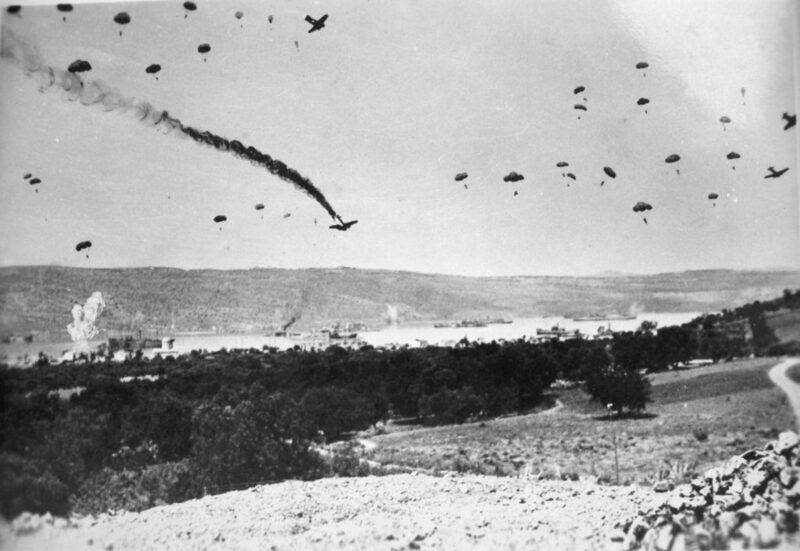 A second wave of paratroopers lands on the already occupied airfield of Maleme. Crete became a German target following their rapid occupation of the Greek mainland in April 1941. After the Italian failure in the Albanian front, German forces had surged into the Balkans, quickly defeating Yugoslavia and outflanking Greek border defenses. 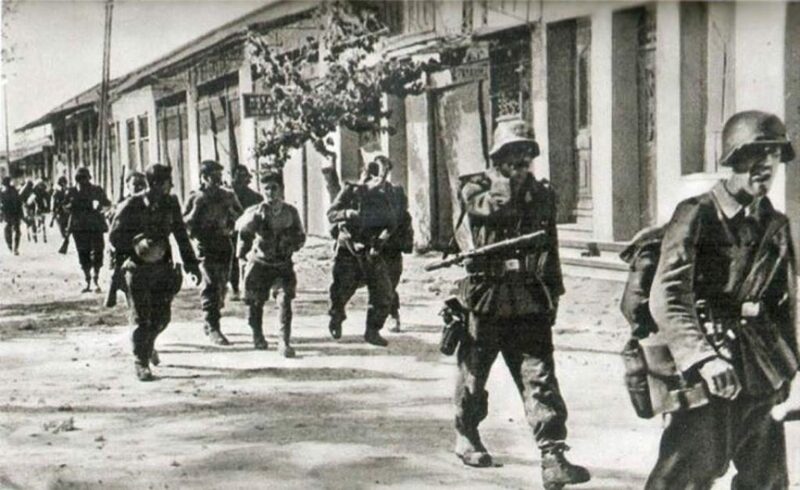 The 80% of the Greek army was still in Albania defending the recent occupied cities and enjoying the victorious battles against the Italians during the operation “Primavera” in the end of March 1941. In the beginning of April Greece had to to face a triple invasion of the German, Bulgarian and Italian armies. The allied expeditionary forces and the Greek army could not defend the north borders any more and they withdrew south. During the last week of April more than 50,000 Allied troops were evacuated from the mainland. By the end of April Greece was under Axis occupation. May 1941. German mountain troops advance to Crete. 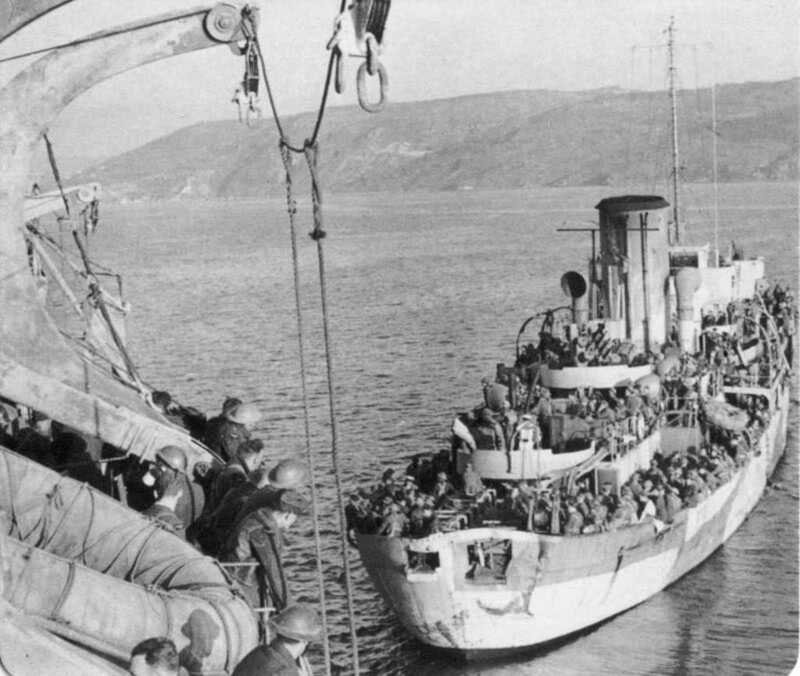 Most of the Allied troops evacuated from Greece were sent to Crete. By the end of April there were more than 44,000 British, Commonwealth and Greek soldiers on the island. 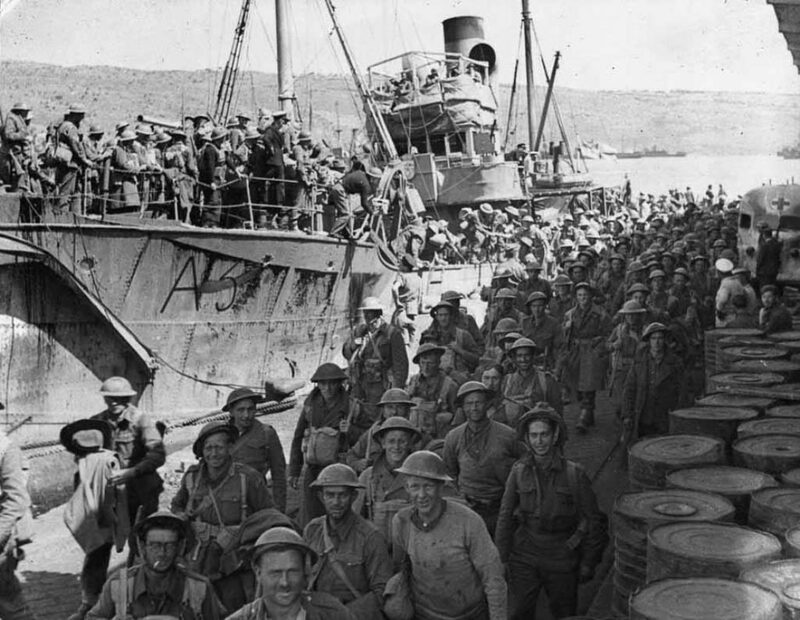 Crete,April 1941.Australian and New Zealand troops disembark at Souda bay after their evacuation from mainland Greece. 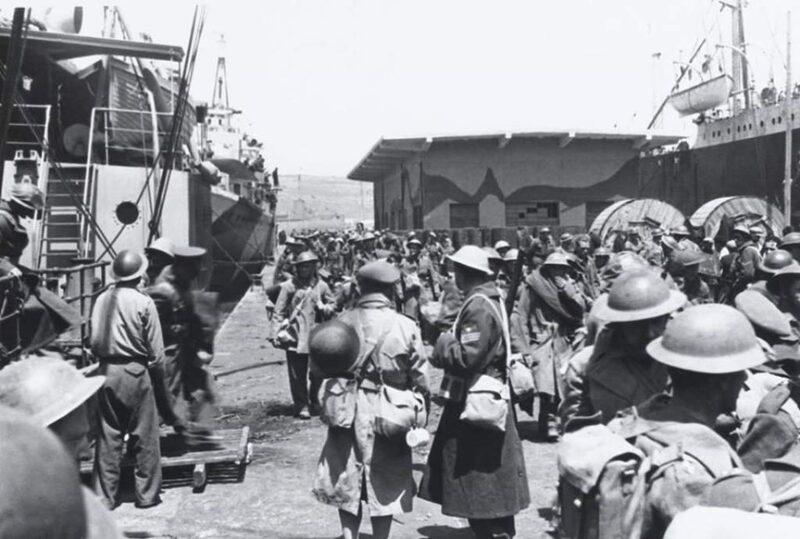 Allied troops arrive in Crete after the evacuation of mainly Greece, 1941 April. On 30 April command of “Creforce” – the designation for the Allied troops on the island – was entrusted to Major-General Bernard Freyberg, who led the 2nd New Zealand Expeditionary Force (2NZEF). He faced a daunting task. During the withdrawal from Greece the British had been forced to abandon their heavy equipment and transport. Most soldiers arrived on Crete with little more than their personal weapons. Ammunition and stores were in short supply, and a lack of tools saw troops digging defensive positions with steel helmets. Heavy weapons – tanks and artillery – were few and far between. Air support was also scarce as the Royal Air Force (RAF) was preoccupied elsewhere in the Mediterranean. Crete,1941. Greek and NZ soldiers together. Geography also made the job of defending Crete tough. The key points on the island were the airfields at Maleme, Rethimnon and Heraklion, and the port at Souda Bay. All were located on the northern coast and faced German-occupied Greece – at its nearest point little more than 100 km away. The loss of any of these positions would make the defense of the island virtually impossible, given the Germans’ ability to quickly deliver men and supplies from bases on the mainland. Yet the British were unwilling to destroy them – the port at Suda Bay was essential to the supply of Creforce, and it was still hoped that the RAF could operate from the island in the future. The invasion began on the morning of 20 May. Shortly after 8 a.m., the men of “Creforce” saw gliders in the sky overhead, quickly followed by the rumbling of an approaching air armada. Hundreds of planes lumbered through the sky, dropping German paratroops into the area around Maleme and the township of Chania. 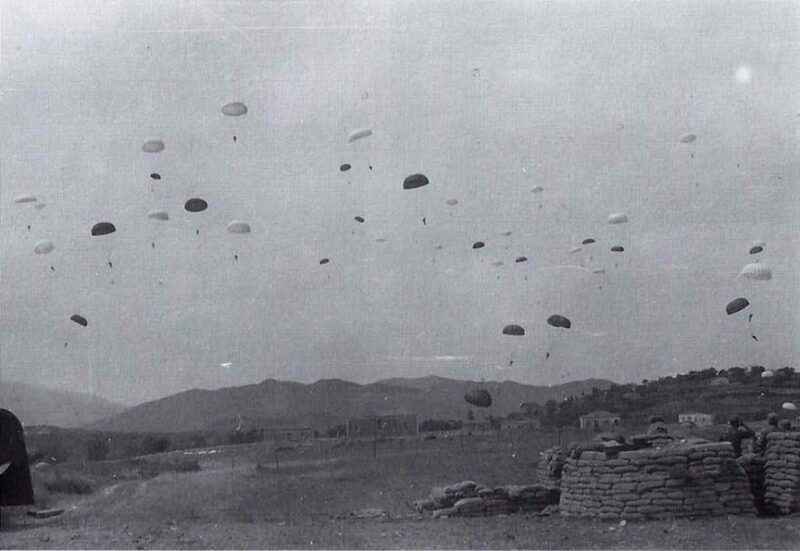 Later in the day, paratroops dropped into the area around the airfields at Rethimnon and Heraklion. German casualties mounted quickly. 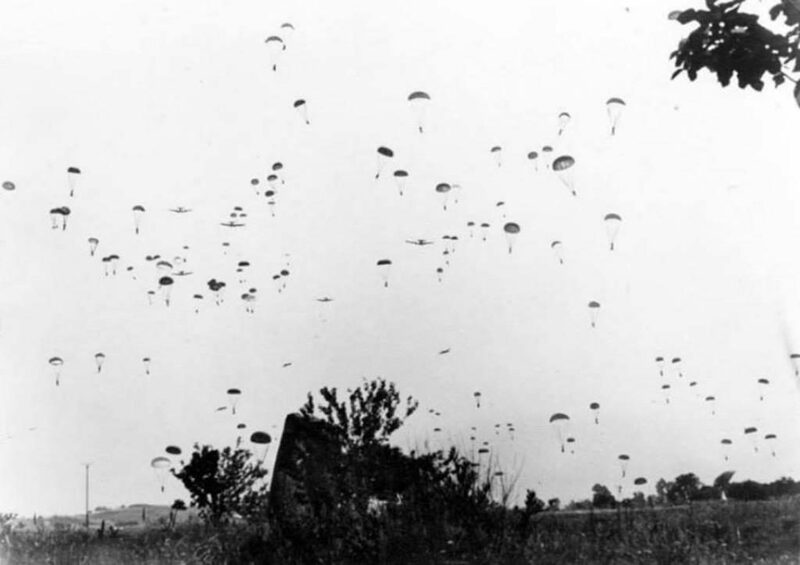 Many paratroops died before they could reach the ground, others were mown down after landing as they struggled to release themselves from their parachutes. Despite heavy losses, enough troops landed safely to secure tenuous footholds west of Maleme (an area mistakenly left unguarded by Freyberg) and in the Prison Valley, south-west of Chania. By the end of the day German forces around Maleme, Rethimnon and Heraklion had failed to secure any of their objectives. Their commanders in Athens feared the operation was a failure and the prospect of a humiliating defeat loomed. It was decided to throw all available resources into an attack on Maleme the next day. Securing the airfield was the key to the success of the invasion, without it, reinforcements could not be sent in. The decision to concentrate on Maleme paid off for the Germans. On the morning of 21 May it became clear that the New Zealand infantry battalions defending the airfield and the key high ground overlooking it had withdrawn. This crucial mistake effectively sealed the fate of “Creforce”. Although the airfield was still under artillery fire, the Germans wasted no time flying in reinforcements which tipped the balance of the battle in their favor. May 27,1941. Germans enter Chania. Fresh troop reinforcements and the dominance of the Luftwaffe (German air force) above Crete left the defenders facing impossible odds. After six days of hard fighting Freyberg received the order to evacuate his weary forces. Parts of “Creforce” pulled back to Sfakia on the south coast, and from here about 10,500 troops left the island over four nights. 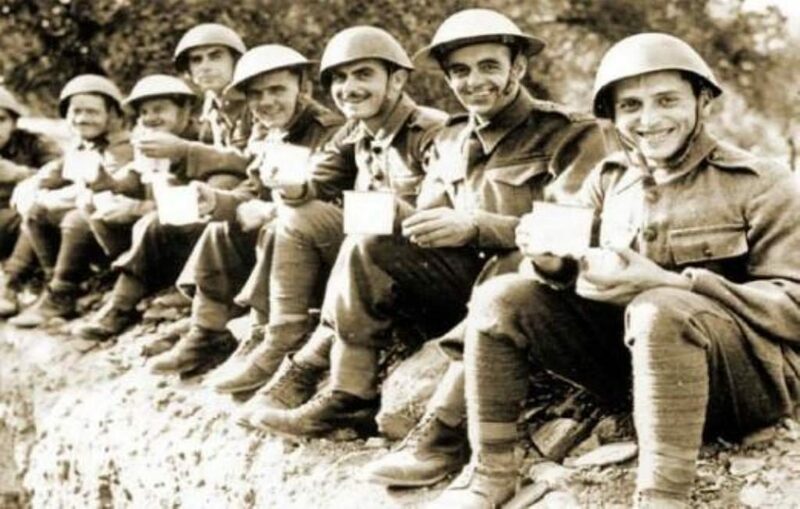 A separate evacuation at Heraklion rescued a further 6000 soldiers, although a number of these men were killed by air attacks on their ships during the return journey to Egypt. The soldiers left behind – around 6500 – formally surrendered to the Germans on 1 June. The majority would spend the rest of the war in prisoner of war camps – initially in Italy and later in Germany and Poland. Others took to the hills, some later escaping to Egypt by submarine or fishing boat. With the help of Cretan civilians, a handful of men eluded capture on the island for years and took part in resistance fighting.